Marilyn SanClemente November 28, 2017 November 28, 2017 handmade card, Handmade cards, Occasions catalog, Stampin' Blends, Stampin' Up! So one of the advantages of being a Stampin’ Up! Demonstrator is that we get to play with new stamp sets and Designer papers early! This Petal Palette stamp set will be in upcoming the Stampin’ Up! Occasions catalog in January. Here are the details on these cards. 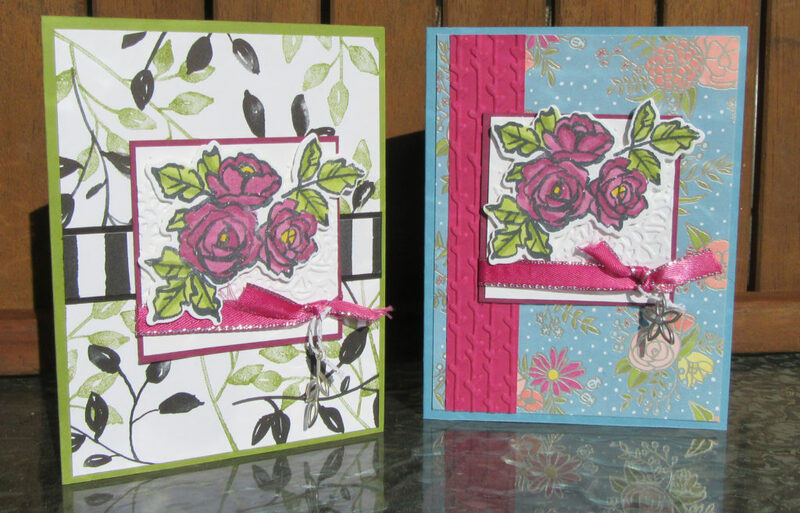 The card on the left uses Petal Passion Suite of products by Stampin’ Up!. This suite includes the Petal Palette stamp and thinlits (Petal Passion bundle) with the Petal Passion DSP. The card base is a piece of Pear Pizazz cardstock. The Petal Pa ssion Designer Series paper is black and white. So I decided to add a little color to it by stamping the leaf from the Petal Palette stamp set with Pear Pizazz ink. 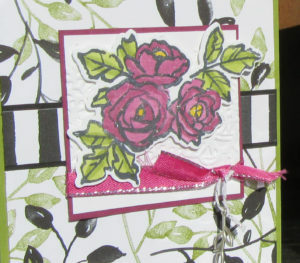 I stamped the Rose image from this stamp set twice on Whisper White cardstock. The images are colored with the new Stampin’ Up! Blends markers. I then added a little Wink of Stella to the Flowers to give them a nice sheen. The flowers are cut with the coordinating Petals & More thinlits. Each flower is mounted on a piece of Whisper White cardstock that has been embossed with the Petal Pair Textured Embossing Folder. This piece is mounted on a piece of Berry Burst cardstock. I used a piece of Berry Burst Metallic Edge ribbon and added one of the Petal Passion embellishments hanging from the ribbon. The second card is the same stamp and color scheme. This card base is Marina Mist cardstock layered with a piece of the Sweet Soiree Specialty Designer Series paper. 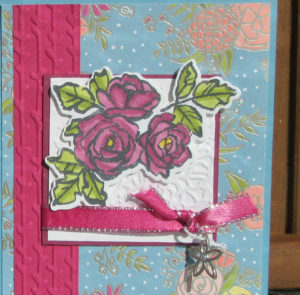 This card has a piece of Berry Burst cardstock on the left side that has been embossed with the 2nd of the Petal Pair Textured Embossing folders. So which card do you like best? I am partial to the Marina Mist Card. Are you on my Newsletter list? Each Wednesday before Christmas I sent out a newsletter with a new Christmas idea. I send out approximately one newsletter a week and I do not share my mailing list with anyone! You can signup HERE. the Stampin’ Up! Year End Sales Event is HERE! !